In an effort to streamline my already bulging skincare pouch for my recent week-long trip to the Pacific Northwest, I thought it would be okay to forego an exfoliator. It's only a week, I thought, and loaded up moisturizers, travel-sized shampoo and other beauty bits instead. If you're reading this and shaking your head, you'd be right to do so because my skin definitely needed a good scrub after a cross-country flight into a much drier climate. Lesson learned - I will diligently pack a good exfoliator to slough off dullness and dirt for future trips. 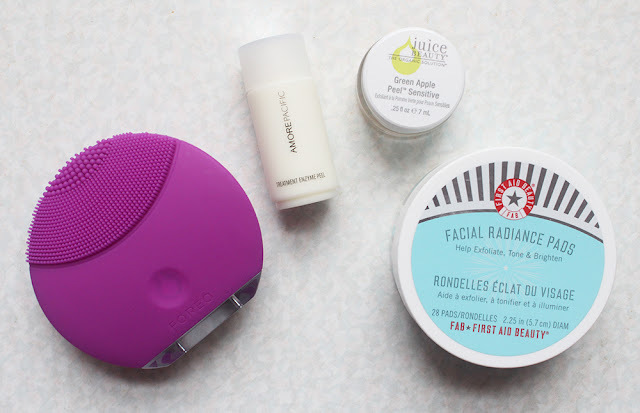 It's been awhile since I've done a post on exfoliants and that's mostly because I haven't tried anything new that has wow-ed me aside from the Foreo Luna Mini. I guess it's more a cleansing tool than an exfoliator but I feel that it has a similar effect since it's supposed to expel impurities from the skin. I purchased this a couple of months ago during Nordstrom's friends and family sale and wanted to use it for some time before sharing my experiences on here. Before I go into the Foreo Luna Mini, I want to give a quick shout out to a few of my favorite chemical exfoliants that I've mentioned on the blog at one point or another. They are the Amore Pacific Treatment Enzyme Peel (sample version shown), Juice Beauty Green Apple Peel for Sensitive Skin (sample version shown) and the First Aid Beauty Facial Radiance Pads. I've used up samples of all three in the past and can see myself purchasing the full size of all of them - they're that good. I'm a big fan of these in particular because they are gentle and really easy to use. I rotate between these and a few other exfoliants I have in my stash a few times a week and it really makes a difference in the texture and tone of my skin. Now let's talk about the Foreo Luna Mini which is something I've had my eye on for years but wasn't sure if it was worth the money. It's regularly $99 but Nordstrom had it for $75 during their F&F sale and offered new account members $10 off. I'm glad I didn't jump on the Clarisonic bandwagon when everyone else was raving about it because I think it would have been too harsh on my skin. Not to mention the cost of having to replace the brush heads is really expensive. With the Foreo Luna Mini, you don't have to replace anything and it lasts for months on a single charge - I haven't had to charge mine yet! The silicone brush head uses "T-sonic pulsations" to gently cleanse the skin and this device has two modes depending on what your skin can handle. I only use the Foreo at night and only on the more gentle pulse setting. Even though the silicone nobs aren't really bristles, I find the more intense pulse setting to be too much for my skin. I use this almost every night in the shower with a foaming cleanser. If I am wearing makeup that day, I remove it first with cleansing water or cleansing oil before going in with this tool. The handy little device skips a beat to let you know to move onto another zone of your face so you don't over do it. I usually don't believe people when they say they experienced immediate results from using a skincare product such as this one. But I did notice a difference in my skin after using the Foreo Luna Mini for only a few nights. It's by no means a life-altering change whereby I don't have acne anymore. I still definitely have breakouts and this hasn't stopped that. But I will say my pores do feel cleaner and my skin quality is ever so slightly better thanks to this little guy. I like that my skin doesn't get red or irritated at all after using this as well. Does everyone need to run out and get this? No, but it's certainly nice to have if you aren't one for fussy skincare and want something to give you a deeper skin cleanse. It'll cost you a pretty penny but it will last you much longer than serums and moisturizers that cost about the same, or more, if the $99 price tag seems hard to swallow. I'd suggest waiting until Sephora's 20% sale which should be coming up soon to grab this if you're interested in trying it. Have you tried the Foreo cleansing devices? What are your thoughts on these new fangled skincare devices?